HOME COURT ADVANTAGE. Valley Heights host the 2018 Class 2A Substate Volleyball Tournament at home this year. 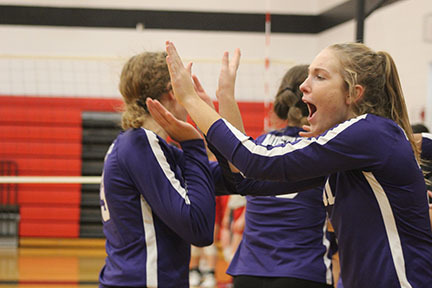 Three more matches stand between the Lady Mustang volleyball team and the state tournament. This year the stakes are even higher for the Lady Mustangs, as they host the state qualifying tournament on their home court. “Having the biggest games of our season on our own floor is very exciting. It is definitely to our advantage.” says junior, Sam Vermetten. The Lady Mustangs are going in as the two seed, and will face Atchison County in their first match at 3 pm this Saturday. Head coach Susan Steinfort says, “We are looking forward to having a great crowd supporting us and giving us the energy we need to play with the sense of urgency that makes us so successful.” Cost for admission is $6 for adults and $5 for students.